The clocks have gone back and the temperature is dropping, it's that time of the year when your immune system gets put to the test. Nutri Advanced has a range of vitamin supplements including Vitamin C, Vitamin D and Vitamin A which contribute to immune health. Our immune support products are developed in conjunction with rigorous scientific research to formulate premium quality and highly effective products. Due to the popularity of our Eskimo Advanced offer we have extended the offer until 5pm 05.11.15 (subject to stock availability). 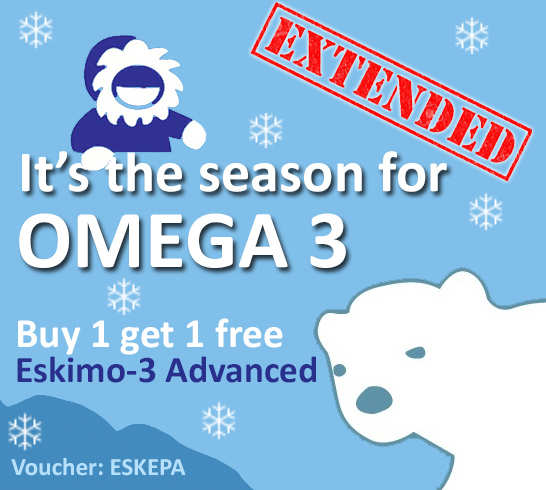 To get this offer, add 2 x Eskimo Advanced EPA to your basket and use the voucher code ESKEPA. *Eskimo Advanced EPA 2 for 1 Offer is subject to availability. Offer is valid until 5pm on the 05.11.15. Offer not valid for orders over £350.